One of France's greatest composers, Jacques Fromenthal Halevy (1799-1862), was also the son of a cantor. His father, Elie Halfon Halevy was the secretary of the Jewish community of Paris and a Hebrew teacher and writer as well. Musically gifted, Jacques was accepted as a student by the Paris Conservatory at age ten and subsequently became a member of its faculty, rising to the rank of professor in 1833. His lasting fame was assured by his grand opera La Juive (18 3 5). The work that gained Halevy early notice was a liturgical piece commissioned by the Consistoire Israélite du Départment de la Seine, for a public service in memory of the Duke de Berry, in the Jewish community's temple on March 24, 1820: Marche Funebre et De Profundis en Hebreu for three voices and orchestra. 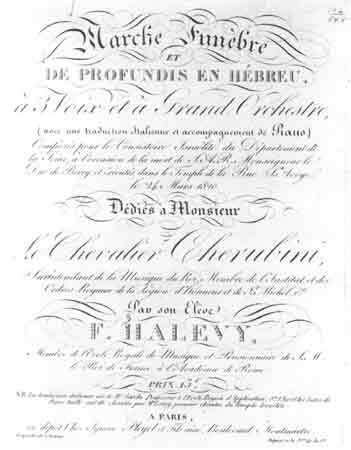 On its engraved title page, Halevy was described as a member of the Royal Institute of Music and a recipient of the patronage of the King of France at the Academy of Rome. Commissioned by the Consistoire Israélite du Départment de la Seine, for a synagogue service in memory of the Duke de Berry; March 24,1820. Jacques Fromenthal Halevy Marche Funebre et De Profundis en Hebreu, Paris, 1820. Music Division. Psalm 130, "Out of the depths have I cried unto thee, O Lord ... Hear my voice; let thine ears be attentive to the voice of my supplications," was sung in Hebrew. Halevy's first biographer, his brother Leon, records that the De Profundis, "infused with religious fervor created a sensation, and attracted interest to the young laureate of the institute." The Library's copy is bound in a volume of holograph manuscripts of works Halevy composed in 1822 in Vienna, among them another mournful psalm, "Psaume, Domine, ne in furore tuo arguas me" (Psalm, Lord, in thine anger, rebuke me not ... (Psalm 6:2). It is possible that the Library copy of the De Profundis may have been the composer's own.